Just finished up on another round robin block. The owner wanted a BE tree but someone beat me to it so I gave her some SRE tree limbs that hopefully are springy and offset the fall tree nicely. Also added the heart, the flystitch lace and some buttonhole fans on the seam! I can't wait to see how this block turns out!!! Its shaping up to be very pretty! 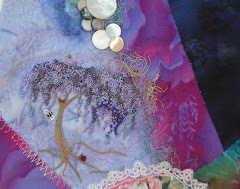 The Fairie Goddess Mother quilting I belong to is currently having a lot of exchanges of what we are calling FTC's! They are great fun and way to share a bit of oneself with others! This only shows a friend I am thinking of her on her special day and hopefully will also bring some loving support to her thru her tough times with work! It's nice to think about anywhoo! Ths s a little needlebook I stitched up for a friend that is new to quilting and hand work! She is a lover of Halloween and animals, both of hers are represented here! I included her name done in various holiday type items and basically had a great time coming up with something a bit different for her to enjoy! I've been on a bit of an ATC binge of late....and made one for a friend in an online group that I belong to that is going thru a tough time. These are a neat way to express yourself and send positive energies, I think! I'm hoping the "mother bear" will help provide protection and love when she is feeling a bit low! And the oak I hope will provide some strength to face the troubles ahead....or...be a shady spot for her to rest and look at the sunset after some strenuous fly fishing! :_) Enjoy! This is a pic of some work I just finished....I did the usual seam treatment with the stitch combo of cretin/herringbone and fly stitch. Then I added beads. I also decorated the doily fan with bullion roses, sre roses and sre leaves the I added an antique metal flower button and a bouquet of sre roses trailing down from it. SRE is challenging for me...does it make big difference in the brand of ribbon used? I really struggled to get it to work...but I haven't done a lot of it either so maybe practice is the issue. I'd like to hear from others on this and what their favorite techniques are!! This is a close up of the BE swan on the rr block. This is the second one i've done and I dedided to change my methodology on this one. I first did the outline for it in a stem/outline stitch. I then did a curved line in a light grey to pull out the direction of the wing then did the chest in one direction and the wing onto the tail in another...this one came out looking more realistic. It's just a bunch of cast on stitches and easy to do....just tough to make realistic! For me anyway! Enjoy! Here I am!!! Been stitching away...trying to get caught up! Just about there! Wahoo!! This is a phot of a rr block I did with a group of ladies here in Colorado! I did a BE swan under a flowering branch, a BE bluebird, a couple of seam treatments..one being a fav stitch combo of mine using a cretan/herringbone stitch for the first round and a flystitch with a lazy daisy stitch at the end. Creates a nice lacy effect I like even though I still have to practice more to get the stitches more even! I also added some old mop's, an old metal flower bead held on with an overlay of cast on stitches (came out kind of cool) and the dragonfly charm! Phew!!! I hope she likes it! It was fun to do regardless! Smiles!